Top Gear is replacing several of their parts. Deadline reports that the revamped version of BBC’s hit car show is taking on two new team members in addition to new host Chris Evans. The revamped version of the series premieres on May 5th. As has been reported, long-time Top Gear host Jeremy Clarkson left the series earlier this year. Along with him, co-hosts Richard Hammond, James May, and executive producer Andy Wilman also departed. And most recently, it’s been reported that new executive producer Lisa Clark is leaving her post only five months into the job. Production on the new version of the series will continue, however. 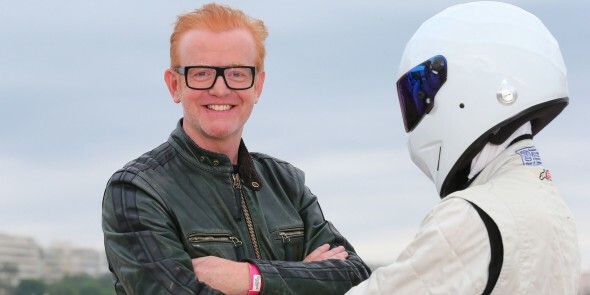 In the place of Clarkson and his team will be new host Chris Evans, a veteran BBC presenter, and two relative unknowns—racing driver Sabine Schmitz and automotive journalist Chris Harris. Former Formula One driver David Coulthard will also join the show. What do you think? Are you a fan of Top Gear? Will you watch the new version without Clarkson and the gang? More about: BBC TV shows: canceled or renewed?, Top Gear, Top Gear: canceled or renewed? Dave’s right on..Jeremy may have overstepped himself but he did nothing more than so many others who have ruffled the feathers of the Top Brass. I doubt that I will watch the new series because the chemistry between the three cannot be duplicated. BBC really has lost a lot because of this blunder. BBC killed itself. the overpaid government brats began sinking the network with the mishandling of the Clarkson incident. No one I know would survive the inept, juvelnile behavior of the top brass in a non-government paid position. Now because of pure huburis BBC has to cut the busget on other shows as well. Won’t be the same without the famous 3. They’re the ones that made Top Gear. Was only ruined by idiots who only watched the show to complain.